Adorable and cute soft toy waiting to be cuddled! 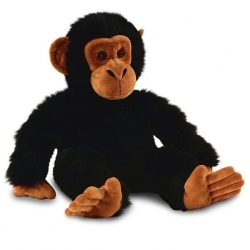 This cuddly 45cm chimp is made with long thick black fur and has shorter brown fur on his hands, face and feet. It has brown eyes. Brand new toy with all tags and labels attached, it fully conforms to European safety standards EN71.